Spoilers ahead for A Time to Love! A century ago the long-running conflict between two alien civilizations ended when both of them colonised the same distant planet, becoming instead a shining example of inter-species cooperation and coexistence. Now an investigation headed by Kyle Riker -- estranged father of Commander William Riker -- has revealed how fragile their hard-won paradise is. Within a few generations, a virus indigenous to their colony planet of Delta Sigma IV will wipe out all its inhabitants. 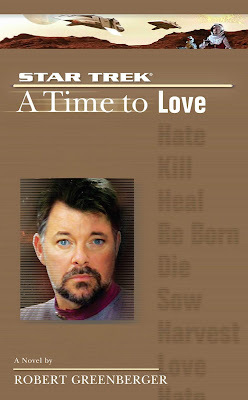 Faced with this threat the delicate shell of harmony starts to crumble... Jean-Luc Picard and his crew, still reeling from the events which have tarnished the career of one of Starfleet's most decorated captains, must come to the aid of a world which once knew only peace, but now faces violence and chaos. Riker, meantime, must face the fact that his own father may be responsible for the anarchy into which Delta Sigma IV is descending. One hundred years earlier, the planet Delta Sigma IV was colonized by two races: the Bader and the Dorset. Long-time rivals, their homeworlds remained in a state of conflict with one another, while on Delta Sigma IV, the settlements experienced unprecedented peace between the two peoples. Eventually, the planet was united under one government, and applied for Federation membership, which was granted. However, a medical crisis soon developed; the population of Delta Sigma IV displayed much shorter lifespans than was typical for their species. The Federation stepped in to assist, and a cure was found. Unfortunately, one of the five test subjects murdered one of his fellow subjects upon returning to the planet, the first such crime committed in a century. Blaming the Federation for unleashing this violence upon them, the citizens of Delta Sigma IV seemed to be descending further and further into violent tendencies. At the center of all of this is Kyle Riker, Will Riker's father, who disappeared along with the murderer, El Bison El. Starfleet has assigned the Enterprise to investigate, locate Kyle Riker, and bring the situation under control. A Time to Love, which is the fifth book in the A Time To series, kicks off a duology by author Robert Greenberger. The events of the previous novels, in which the luster of the Enterprise has dulled somewhat, are taking their toll on the ship and crew. In fact, a number of crewmembers have requested transfer off of the Enterprise, while the new personnel who have recently transferred in are not of the same caliber that the Enterprise crew is used to. One such crewmember is Anh Hoang, a new addition to the Enterprise's engineering staff. We learn that she lost her entire family in the Breen attack on Earth (in the Deep Space Nine episode "The Changing Face of Evil"), and that due to this trauma, she has had a difficult time socializing with other people, an issue that Troi attempts to tackle in her role as ship's counselor. Because this is just the first book of two, we don't see this part of the story pay off right away, which led me to dismiss it as unrelated to the overall narrative. However, we do return to it in the next book, and ultimately Hoang's story is resolved. This leads me to the main issue I had with this novel, and indeed, many of the stories in the A Time To series. It really does feel like these duologies should have been presented as one novel each rather than being split into two parts. The point at which the story ends with "to be continued" feels arbitrary, especially in the case of this story. This leads to much of this book feeling like it's "treading water." The bulk of the story is taken up by Riker's search for his father, a search that feels quite meandering. He and his guide travel from town to town trying to pick up Kyle Riker's trail, and the process continually repeats itself. It isn't until the very end of the novel that Kyle is finally discovered just in time for the book to end. The central mystery in A Time to Love is the disappearance of Kyle Riker, and the attempt by his son, Will, to locate him. That's not to say there aren't good aspects of A Time to Love. Even though the plot feels thin at times, much room is given for some terrific character moments. In addition to Troi's work with Hoang, there is some tension building between Beverly Crusher and Captain Picard. 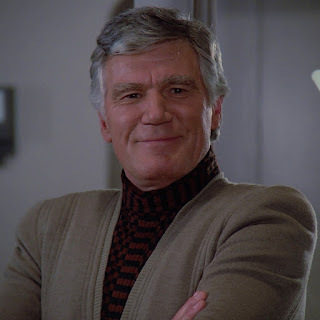 The former has been offered a position as head of Starfleet Medical, but hasn't confided in Picard about it. The two seem to have been drifting apart for some time, and Crusher is seriously contemplating moving on from her position on the Enterprise. This is a story that will continue to play out over the next few books as we close in on Star Trek Nemesis. One part of the story that frustrated me was the seeming inability of the characters to close in on the cause of the problems on Delta Sigma IV. There is a gas that is naturally present in the atmosphere of the planet called liscom. Reading this story, I was certain partway through that the gas was not only responsible for the shortening of the inhabitants' lifespans, but also for the peace that had endured on the planet. When the "cure" was introduced, which inhibited the effects of the gas, the "natural" tendency of the two races to fight each other was once again unleashed. However, it takes forever for Beverly to come to this conclusion which I felt was somewhat telegraphed. Thankfully she discovers this before the end of this novel; I was concerned that the revelation would be held until the next book, A Time to Hate! 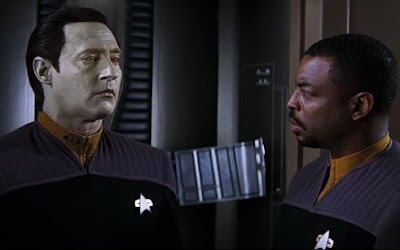 Data and Geordi have an interesting B-plot in A Time to Love. There is also an interesting B-plot, in which Geordi organizes a program of bartering in order to acquire needed parts to repair the Enterprise. Using a Ferengi merchant, Geordi is able to set up a system whereby various starships throughout the sector can trade for parts they need, paying the Ferengi merchant with dilithium. At first, this struck me as quite odd, akin to a U.S. Navy warship employing sport fishermen to barter supplies, but eventually I warmed to this part of the story. Highlighting the dire circumstances following the costly Dominion War, Federation resources aren't what they once were, and a more fitting analogy might be sailing ships in the Age of Discovery bartering for supplies and resources with groups along their journey. For much of this story, it feels like the plot is treading water. This may be because the story had to be stretched over two books, but I can't say for certain. There are moments where I feel like the characters should be able to figure out problems easily, but the resolution is stretched and delayed. However, there are some nice character moments, and a few interesting ideas that move the plot forward. It is also difficult to review this novel as it is only half of the complete story and feels like it was split in two at a fairly arbitrary point. Not a bad read, but definitely a bit of a step down from the previous two novels in the series. Good character moments and Greenberger's obvious familiarity with the characters and the world they inhabit bump the score up a bit. Next up is a video review of Star Trek: Lost Scenes by David Tilotta & Curt McAloney. Look for that soon!